We bought a car in New Zealand and traveled the south Island staying in campgrounds and motels. We decided to leave Sally at dock and travel by car for a change. 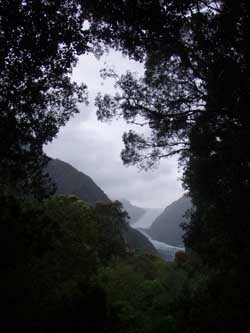 The weather on the south island can be quite robust so it seemed a safer way to go. And Sharon did not want to travel any further south than 40 degrees! We had a great time zipping around the Island in our little car. 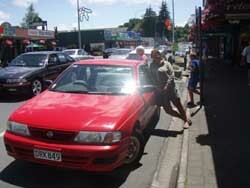 We named the car Kiwi Lui Whaka Ewe (with help from Terry Trashel). Wh is pronounced like a ‘f’ in New Zealand place names. We did almost a car-circumnavigation of the South Island. The scenery and the people were memorable and we treasure the memories. But it was just like a car vacation - interesting - but little in the way of adventure. The trip was interesting and we are glad that we did it. The unique thing about the South Island is that it is more remote and rugged than the North. Kiwi's consider the south the wild west of New Zealand. Most of the south is rugged and undeveloped. However, hot spots like Queenston reminded us of Whistler, BC, Canada. i.e. rampant development of a trendy ski resort. Click here to look at a few New Zealand south Island pictures. Oops, there are a couple of pictures which were taken on our way to the south island. If you are from New Zealand, see if you can determine which pictures don't belong in a south island slide show. Our South Island travels took us from windy Wellington across the notoriously rough Cook Straight to Picton in Marlborough sound. Marlborough Sound is very beautiful. From there we drove south to Christchurch and on to the picturesque town of Dunedin – with its Scottish roots. Next we rounded the south coast to Invercargill. Invercargill gained some recognition in the movie - 'The World Fastest Indian'. In the movie the eccentric main character, hailed from Invercargill. From Ivercargill we motored north up to the very busy trendy city of Queenstown. Then further North and over to the west coast towns of Hast, Greymouth, and Westport. East and north from Westport up to Tasman Spit and Golden Bay. Then Tasman Bay and Nelson and completing the circle back at Picton. Here is a slide show of the west coast.